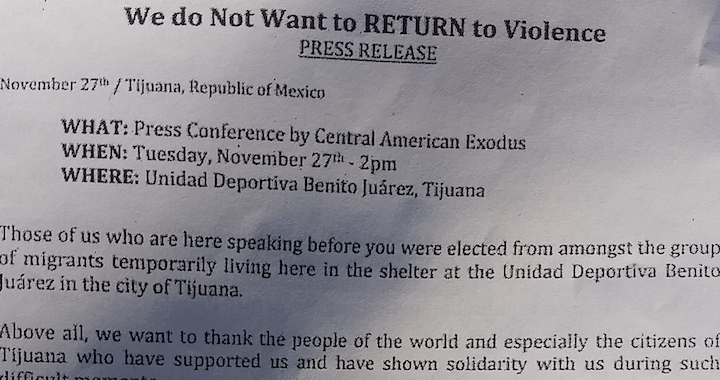 The following is a press release issued by asylum seekers of the Central American Exodus the day after Border Patrol fired migrants, including children, with teargas on 11/26. Scroll below the PDF to read the transcribed press release. Those of us who are here speaking before you were elected from amongst the group of migrants temporarily living here in the shelter at the Unidad Deportiva Benito Juárez in the city of Tijuana. Above all, we want to thank the people of the world and especially the citizens of Tijuana who have supported us and have shown solidarity with us during such difficult moments. It has not been easy to leave our countries, to leave part of our family behind, to expose our children and walk through unknown places in order to have a chance to live in the United States or other countries that can give us an opportunity to work an honest job and offer a better future to our children. We want them to have access to education, healthcare and a life without threats. Today marks the 46th day of our EXODUS and we are very worried because we are fleeing a very serious situation. We are fleeing from violence and impunity in our countries and now there are so many of us that this has become a crisis. This is an emergency and we need information to make the best decisions to protect our lives. Last Sunday we were the victims of repression by the U.S. border patrol, who launched teargas at us several times, affecting the children. We were only walking so that the people would be visible, so that that they would recognize that we are a large group of people who just want to be heard so that international law can protect us as we migrate and seek to improve our lives. There are international organizations here that accept as fact that we will not be able to enter the United States and that we should be returned, but many of those us who are traveling have to continue trying because they will kill us if we return to our countries. We are very worried about our compatriots who disappeared in Veracruz and other places we have passed through. We are also worried about the detentions. Every day people disappear from the shelter, and we have noted the presence of people will ill intentions who come to offer us other ways to get across that would endanger our lives. The report from the Tijuana police says that they have detained 164 Hondurans, 13 Salvadorans, 1 Nicaraguan and 16 Guatemalans. For an end to the arbitrary, manipulative and involuntary deportations. For an acceleration of the process of applying for asylum in the U.S.
For the formation of a commission by the incoming Mexican government to negotiate a permanent solution for those who wish to stay here. We suggest that Mrs. Nashieli Ramírez, Director of Mexico City’s Human Rights Commission and Mr. Arturo Peimbert, Ombudsman for the city of Oaxaca. For the names of those deported to be released publicly to civil society. For there to be Human Rights accompaniment at all times and during any detention to prevent the violation of migrant human rights. On the march… ¡with dignity! Posted in Announcements, News, NLG Blog and tagged Asylum, Central American Exodus, human rights, Immigration, Refugee Caravan.